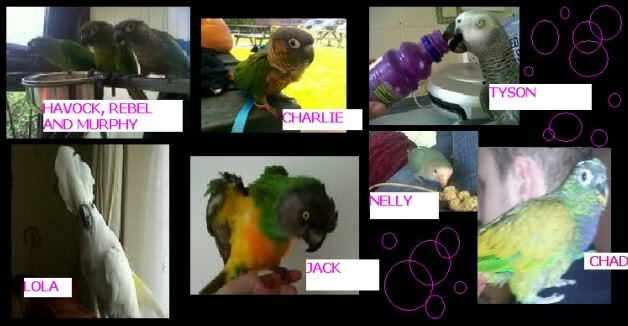 Problem Parrots will be accepting an invitation by Margy to visit her and her gym class in the wirral on the 11th august 2012. The details will be posted a bit closer to the time but if you can spare a few hours that would be great. The postcode of the meet is CH48 4HX for anyone thinking of coming, all very welcome. Gym starts at 9.00 am, and finishes at 1.00pm, it's a leisure centre so plenty of space, toilets, food, etc. Oh and it's not far from the beach too! Ooooo I'll be there, it's becoming an annual birdie day function on my calendar now going to the centre, seeing all the kids and lots of birdie talk. Can't wait. So Myself, Shell, Hollie, Margy and Sue!! Apologies from me, it's many miles from here, also the family are back down for their summer hols! I'll bring one of my birdies, don't know which one yet. What's the nearest train station Margy? West kirby, it's right outside the leisure centre. Hollie, there is definately no getting lost, and if you bring the gymnast I'll ask the other coach if she can join in all morning with them in the sportshall! Don't forget everyone that's coming, a meet the family, a cup of tea and a fly for the birdies in the aviary afterwards, and Hollie I'll give you a lift back down to the station, it's only about 2 minutes drive from my house. And again, everyone is welcome to come along to the centre in the morning, we finish at one, so it on't be an all day thing. Bring birdies, bring yourself. That's lovely Margy, lil had asked if she could come once she heard where I was going, I said I'd see, shes just been over the moon when she read what you had put, thank you so much, you've made her day! That sounds like an absolutely brilliant day! Well tell her that he is an international coach and he has had two world tumbling champions! Both of whom happen to start with me at 4 years old! I'm sure he'll be fine with it, he just loves to show off!! !